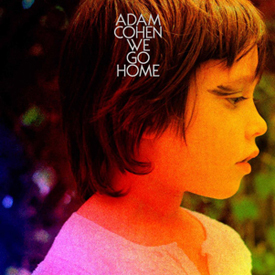 Trying to review WE GO HOME without drawing comparisons is virtually impossible as Adam sounds uncannily like his father and he also writes about very similar subjects in a very similar style; and his father gets mentioned several times in the lyrics. Opening track ‘Song of Me and You’ finds Adam in a very tender mood playing a nylon strung guitar as a string quartet backs him on a charming and reflective love song that sounds like it could have been written on the island of Ibiza. Adam never tries to hide his DNA; and why should he when he can write something as beautiful as the enchanting ‘Love Is’ which casually mentions ‘Hallelujah’ in the opening verse and features harmonies from a female backing group and a string trio that must have been transported to Earth from Heaven above. Fall Apart appears to be a love song written to his father; but if you take away the references to Montreal the sentiment actually echoes my own relationship with my departed father and could be about many of our personal relationships; which is always the sign of a great songwriter. While I’ve genuinely loved the whole album, my favourite track is ‘Swear I Was There’ because Cohen’s piano playing goes from gentle tinkling through to power chords on a four minute song of epic proportions that showcases his voice and words like nothing else hear. Every song has a poetic and deep feel to it; but not in a snobby way as the melodies and choruses make them all accessible to music lovers rather than just music snobs; which was the case with much of his father’s earlier work. So Adam Cohen is the eldest son of the God like Genius; Leonard and this is his fifth album; yet I’d never heard of him. Yes, he sounds like his father but that’s hardly a bad thing, is it? After listening intently to WE GO HOME for over a week I now intend seeking out Adam Cohen’s back catalogue.